The dream of all-vegetarian McDonald’s restaurants has taken a step closer to becoming a reality. After offering 50% vegetarian menus at most of its restaurants in India, McDonald’s has taken the next step with the announcement of their first two all-veg restaurants, which will open in India in the next few months. While this is big news for the global veg world, it has many in the veg movement hoping that other countries will be next, including the good old US of A. A recent survey showed that fully 40% of the Indian population follows a vegetarian diet. While the percentages are lower here in the US, one recent survey showed that there are as many as 15 million vegetarians in the US and millions more veg-curious. With deeper pockets than their Indian counterparts, McDonald’s may just be tempted to tap into that market, if their experiment in India pans out as expected. The fact that McDonald’s is able and willing to respond to cultural norms is a good sign that the company is not irrevocably stuck in its ways. American consumers will have to drive the changes they’d like to see to McDonalds’ menu, by letting the company know of their desires, and that’s where we can all make a difference. Their first vegetarian restaurant in India will open its doors middle of next year. It will be located near the Golden Temple in the Sikh holy city of Amritsar in northern India, where religious authorities forbid the consumption of meat at the shrine. After the opening in Amritsar, the US chain has plans to open another vegetarian restaurant near the Vaishno Devi cave shrine in northwestern Indian Kashmir – a revered Hindu pilgrimage site that draws hundreds of thousands of worshippers each year. 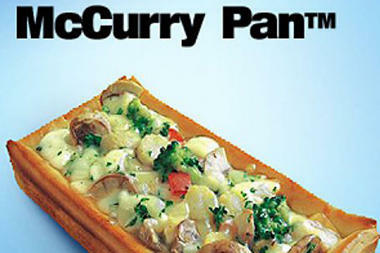 The vegetarian restaurants will sell items such as the McAloo Tikki burger, a sandwich with a mashed-potato patty, and the Pizza McPuff, a vegetable and cheese pastry.